KANNAPOLIS, North Carolina (April 4, 2018) – Aric Almirola and the No. 10 Smithfield Ford Fusion team for Stewart-Haas Racing (SHR) are ready to head to Texas Motor Speedway in Fort Worth where they, alongside their SHR teammates, will mark the 1,000 race start milestone for SHR as the green flag waves on Sunday after the Monster Energy NASCAR Cup Series returns to the track from a week-long hiatus. Almirola is rejuvenated for the upcoming 10-week stretch of races after vacationing with family. Almirola returns to Texas this weekend after having already visited the track earlier this year. He participated in a two-day Goodyear Tire test Jan. 9 and 10 with the No. 10 team and crew chief Johnny Klausmeier. Before the Tampa native climbs behind the wheel of the No. 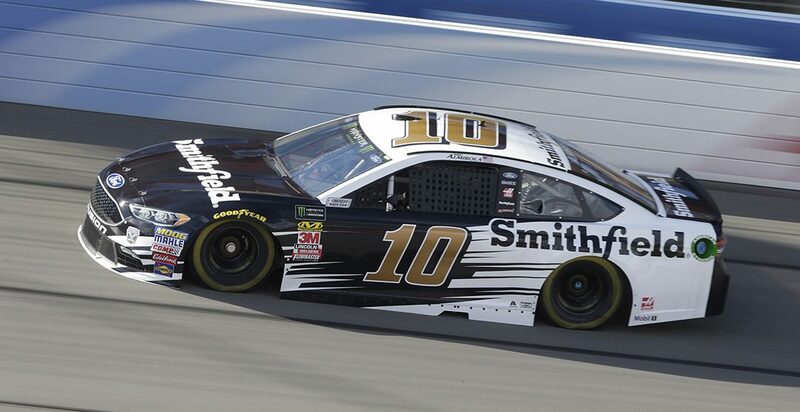 10 Smithfield Ford Fusion on Friday, he will participate in Texas Motor Speedway’s Speeding to Read Program at two elementary schools in the Dallas/Fort Worth Metroplex. As part of the educational program, Lionel Racing has students design their own paint scheme for a Cup Series stock car. Almirola will crown the overall champion at Diamond Hill Elementary School as well as the kindergarten through second-grade winner at B.B. Owen Elementary as part of Lionel’s “Design a Die-Cast” program. The overall champion’s car design will be sent into production by Lionel and will be available for purchase at major retailers throughout the country at a later date. Texas is the third mile-and-a-half track in the first seven stops on the 2018 NASCAR Cup Series tour and Almirola has finishes of 13th at Atlanta Motor Speedway and 10th at Las Vegas Motor Speedway at the first two venues. The 34-year-old driver will make his 15th Cup Series start this weekend at the Lone Star State track. He earned a best finish there of seventh in April 2013. In last year’s events at the Fort Worth track, Almirola captured finishes of 18th and 15th, respectively. Texas marks the sixth weekend the Smithfield livery has adorned Almirola’s No. 10 Ford Fusion. Smithfield, a brand of Smithfield Foods, which is based approximately five hours northeast of SHR headquarters in Smithfield, Virginia, is in its seventh season with Almirola and its first with SHR. Founded in 1936, Smithfield is a leading provider of high-quality pork products, with a vast product portfolio including smoked meats, hams, bacon, sausage, ribs, and a wide variety of fresh pork cuts. With a wildly successful start to the season, SHR was once again the victor at the most recent Cup Series race two weekends ago at Martinsville (Va.) Speedway. This time, it was Almirola’s teammate Clint Bowyer capturing his first win for the Kannapolis, North Carolina-based team. Almirola continued his solid start to the season coming off of a 14th-place finish at Martinsville after running in the top-10. The Ford driver was also the Mobil 1 Performance Award winner for his strong day after 45 passes in the weather-delayed event. With Mobil 1’s technology all four SHR entries completed the 500-lap race in the top-14 and maintained four of the top-11 spots in the driver point standings. Bowyer’s victory was the 47th in SHR’s 10-year history. Almirola also has his eye on victory lane as he continues to surpass his early performance from his previous 10 Cup Series seasons with an average finishing position of 11.2 through the first six races of 2018. To this point in the season, Almirola has completed a combined total of 1,808 laps around the first six venues on the Cup Series schedule for a completion rate of 99.8 percent. In addition to Almirola’s strong finishes at 1.5-mile tracks this season, he has had solid performances at varying track styles with finishes of 11th at Daytona (Fla.) International Speedway, seventh at ISM Raceway near Phoenix, 12th at Auto Club Speedway in Fontana, California, and 14th at Martinsville. In addition to his Cup Series experience at Texas, Almirola has four Xfinity Series starts with four top-20 finishes, along with five laps led. He’s also made nine Camping World Truck Series starts at the 1.5-mile track with two top-10 finishes and 14 laps led. Ford has won four of the season’s six events to mark the manufacturer’s best start to a season since 1997, when it captured four victories in the first six races. At Texas, Ford is tied for the most all-time Cup Series victories by a manufacturer with 13. Almirola’s teammate Kevin Harvick is the most recent Texas winner. Ford also maintains the top spot in the manufacturer standings with a six-point lead. This weekend’s race at Texas marks Almirola’s 251st career Cup Series start. What makes Texas Motor Speedway unique? How noticeably different are the four turns at Texas from your seat in the car? Do you notice that the track surface is different from year to year there? Aric Almirola will make his 15th Monster Energy NASCAR Cup Series start at Texas Motor Speedway in Fort Worth this weekend to bring his total of career Cup Series starts to 251. The Smithfield driver is looking to keep alive his streak of top-14 finishes at each of the first six events this season. Almirola has made four NASCAR Xfinity Series starts and nine Camping World Truck Series starts at Texas. The 34-year-old has led a combined total of 19 laps in both series. Stewart-Haas Racing (SHR) will record its 1,000th start once all four of its entries take the green flag Sunday. Texas is the third 1.5-mile track of the season for Almirola and the No. 10 team led by crew chief Johnny Klausmeier, a graduate of the University of Maryland, Baltimore. The Tampa native enters the weekend coming off of a 14th-place finish at Martinsville (Va.) Speedway two weekends ago. Almirola was the Mobil 1 Performance Award winner after completing 45 passes. All four SHR drivers emerged in the top-11 of the driver standings after Martinsville. Teammate Clint Bowyer captured the victory in the weather-delayed Monday event. Ford has won four of this season’s first six races and leads the manufacturer standings by six points. Before piloting the No. 10 Smithfield Ford Fusion this weekend at Texas, Almirola will visit two Fort Worth area elementary schools as part of the track’s Speeding to Read program. Both events are open to the media. Klausmeier is in his first full-time season as a Cup Series crew chief. The native of Perry Hall, Maryland transitioned from an engineer to Almirola’s crew chief for the 2018 season. Klausmeier has one win as a substitute crew chief while filling in for Tony Gibson at Pocono (Pa.) Raceway in June 2016. As a race engineer at SHR, Klausmeier has worked with drivers Ryan Newman, Danica Patrick and, most recently, Kurt Busch. During last week’s Cup Series hiatus, SHR announced a partnership with Go Bowling. Almirola will pilot the No. 10 Go Bowling Ford Fusion at Watkins Glen (N.Y.) International in August. SHR has two victories at Texas, most recently with Harvick in last year’s November race. The team has also earned five poles, eight top-five finishes, and 19 top-10s in 54 starts at the 1.5-mile oval.